Check out advertising agencies around Wichita for advertising campaigns, creative strategy, branding, logo design, marketing and promotions. Established in 1960. 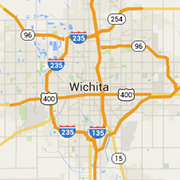 Get your message in front of the right people with Wichita's direct mailing specialist. A provider of elegant, durable environment, trade show and corporate displays. Full service consumer research facility with the ability to recruit, host and report on focus groups, surveys and more in Wichita, Kansas.